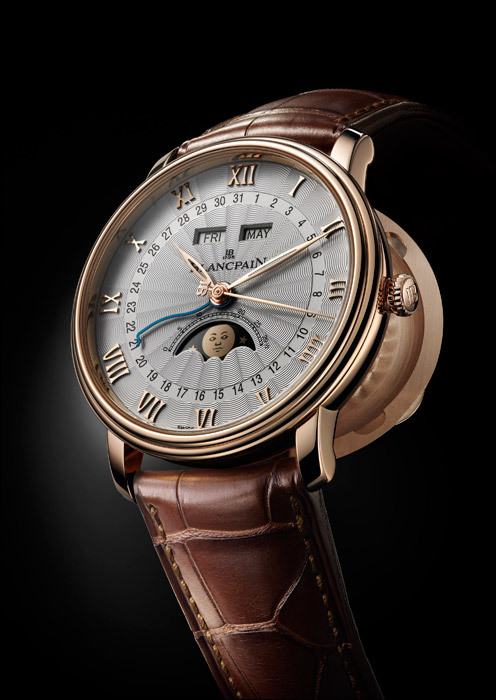 Baselworld 2010 marks the 275th Anniversary for Blancpain and is the occasion for the debut of a new Villeret Collection. The first timepiece from this new series to be unveiled is a new complete calendar moon-phase model featuring a fully secure calendar mechanism, and under-lug correctors, fitted into a half-hunter red gold case. This new Blancpain Villeret Collection distills aesthetics and complications that have been at Blancpain’s core since the early 1980s. The understatement and elegance that have always marked Blancpain’s Villeret models have been brought forward in a new way, backed by the technical advances achieved through Blancpain’s heavy investment in movement development over the past several years. The complete calendar moon-phase has always been the signature complication for the Villeret Collection. This Blancpain’s exclusive in-house automatic calibre is fitted with a balance oscillating at 28,800 vibrations per hour with an antimagnetic index assembly, and with two barrels guaranteeing it a 72-hour power reserve. Nearly as complex as a full perpetual calendar, this Villeret model features a revolutionary method for adjusting the indications without fear of movement damage, regardless of the time of day. To facilitate setting of the indications, Blancpain has equipped the new Villeret timepiece with its patented under-lug correctors. This not only leaves the sides of the watches with a remarkably pure finish, unmarred by the presence of adjusters, but also means that changes can be accomplished with one’s finger tips instead of requiring a dedicated tool. For the first model of the new Villeret Collection, Blancpain has opted for a 40 mm red gold half-hunter case and a decorated opaline dial.